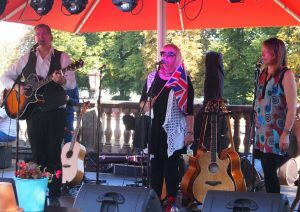 Noah’s Cape is a three piece folk band comprised of Linda Watkins, Marian Wedley and Mark Niel. Three talented singer songwriters combine to deliver unique sets of traditional and original songs with innovative arrangements and trademark three-part harmonies. 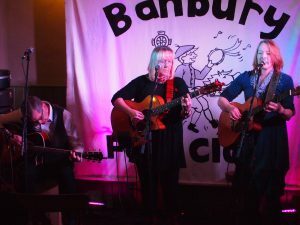 Their songbook covers a wide range of material from embellished traditional folk to classic pop covers all delivered with verve, a poetic edge and wit. 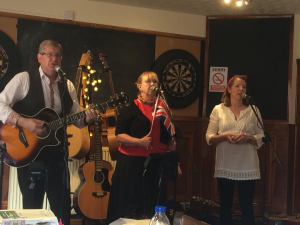 Each singer brings their own musical background and heritage to the mix including gospel, Celtic tradition, choirs and the minstrel / troubadour. 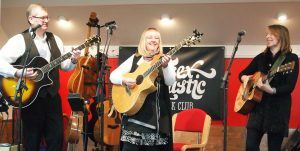 The current line up made their debut in 2018 and from a standing start, they have a busy diary with gigs at folk clubs, festivals and community events. “Well worth noting in your diaries to see again whenever they are on”. 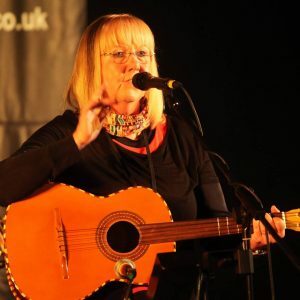 Linda Watkins no stranger to her local folk circuit, is an experienced singer/songwriter and multi-instrumentalist with her music enjoying radio airplay on BBC and community radio stations. 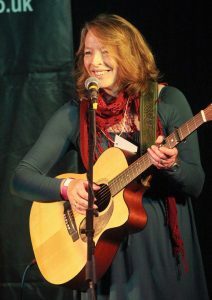 A woman with an immensely positive attitude, she commands her stage quickly building a great rapport with her audiences. From heart rending songs to light hearted anecdotes and a huge sense of fun, you are assured that entertainment is high on her agenda. Marian Wedley is a Buckinghamshire lass with a full catalogue of well written observational material covering subjects as diverse as the demise of the Ash tree to the working practices on a building site! She is adept at writing humorous pieces as well as commenting on more serious and hard-hitting issues. Her sweet and delicate vocals lend themselves to the subject matter of her songs in a way that draws the listener in from the first note. Mark Niel is a Poet, Writer, Actor and Musician. As a poet, he brings smart lines and high-energy performances to unsuspecting audiences. Mark was appointed Milton Keynes’ Poet Laureate in May 2011. Mark sang his first solo at the age of seven in Sunday school and learnt to harmonise in gospel services. 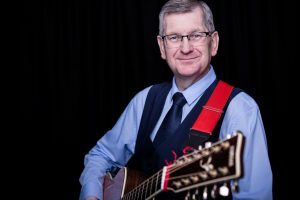 Mark started playing guitar at the age of fourteen and he has always been drawn to artists who put their life into their songs such as Loudon Wainwright III, Ezio and Suzanne Vega. Mark sang as a tenor with choir Heart and Music for five years and has also undertaken principal roles in Musicals such as Kiss me, Kate, Seussical and City of Angels. His first musical love has always been the simplicity of guitar and voice, especially when tunes are embroidered with lush harmonies.